We’ve been so inspired by the looks coming from Market! Our lead designer and founder, Jesse Bodine, has rounded up just a few of her favorites from Fall Market that are available now, as well as pieces that were just revealed at Spring Market! Since most of our favorites are still only available for pre-order, we recommend getting on the waitlist for these new products soon! With natural single-sourced woods, unexpected patterns, and pleasing geometric features, these consoles and sideboards will wow guests and become the focal point of any room. Lunas Sideboard | With soft shaping and inset top inspired by classic jewelry setting, gold guanacaste forms a beautifully sculpted silhouette, with natural high and lowlights coursing the entirety of this richly styled sideboard. Cuzco Small Media Console | Slender legs of gunmetal-finished iron support a black ash frame, as resin fills the natural graining of bleached yukas. Pattern and depth of resin vary from piece to piece, due to wood species’ inherent nature. 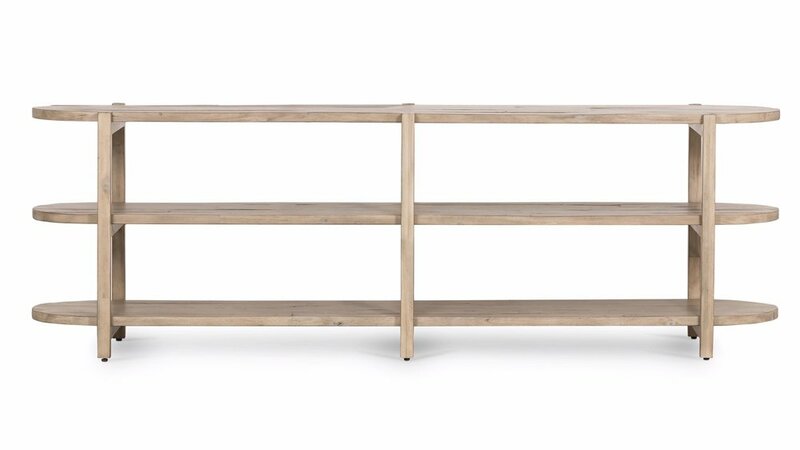 Colbert Media Console |Inspired by durable materials commonly used by architects, clean gunmetal-finished iron framing supports three long tiers of open-style shelving of safety glass, manufactured for strength and resistance. Babs Media Console |A light wash and open styling speak to the desert influence of this modern-minded and organically beautiful media console. Rounded edging adds a sculpted, trend-forward feature that only extends its natural personality. Maximize on style and space with these wow-worthy sofas. With plenty of room for seating and snoozing, everyone will have a spot at your next get-together. Reese Sofa | Effortlessly on-trend, this two-cushioned sofa features sage top-grain leather, kin=fe-edge pillow, and wilted track arms. Almond-finished legs taper fro a modern touch atop a mid-century modern influence. Diana Sofa |Chic and eye-catching, the Diana is upholstered in ivory performance-grade fabric, features angular track arms, and four cushions for maximum seating. Exposed paranoid framing creates mid-century vibes. Lexi Sofa| Hip, modern silhouettes, with abiding mid-century spirit. Hand-applied tufting delivers new depth to bench-made sofa styles. Petite and midsize styles are perfectly scaled for fashion-forward lofts and city living. Holden Chaise | Mid-century swank modernized by mixed materials. Toasted ash casing contains exclusive top-grain leather, cocoa in color and lightly tufted for comfort. Oxidized iron legs and lumbar pillows for a forward-thinking finishing touch. Also available in Cream Upholstery. Wickham Full Sofa Bed | A simple, stylish silhouette redefines the classic sleeper sofa. With knife-edge pillows and neutral performance-grade upholstery, a discreetly concealed sleeper mechanism allows for one-step pullout with ultimate ease. Unfolded, a comfortable full-size bed is ready to welcome overnight guests or make movie nights a little comfier. From gorgeous pedestal tables to head-turning twists on traditional styles, we are loving these unique tables. Transform your kitchen, breakfast nook, or dining room into a designer-inspired dining space. Mina Bistro Table | This solid aluminum table is finished in antique ruse for a visually arresting look, indoors of out. We recommend covering this industrial beauty during inclement weather. Coventry Round Dining Table | A round of rustic elegance. A shapely, turned base, reclaimed pine pedestal and rounded top, perfect for everyday dining or entertaining. Mia Round Dining Table - Parchment White | Bring a noble sense to the table. Banded legs of brass-finished steel support a rounded tabletop, as a high-gloss sheen enhances the natural texture and tone of white concrete. Powell Dining Table with Bluestone | The lovely and feminine tulip frame of this table is blended seamlessly with a rustic black iron finish to create a table that is both sweet and serious. Conner Dining Table | Simple while sophisticated. A clean, Parsons-style dining table of black-washed oak adopts new depth by way of a bluestone inset top and cleverly splayed legs. Boyd Extension Dining Table | Petite in scale, big on style. A table of toasted oak speaks to a mid-century influence, while a self-storing butterfly leaf allows for extension from 74" to 94". We’re seeing more & more creatively designed accent table styles making their way on the scene. And it’s about time. Small but mighty, these pieces are the perfect way to make a statement in your space without going overboard on the budget. 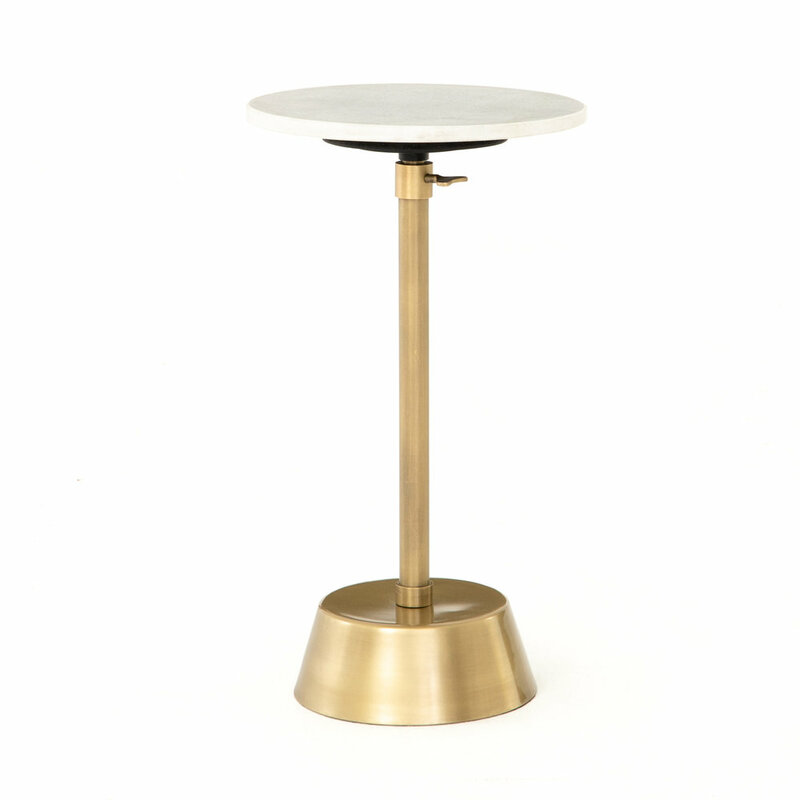 Bree Adjustable Accent Table | Glamorous yet simple, this slim, adjustable base of brass-finished steel supports a rounded white marble top, perfectly sized to perch a drink. This table is also available in antique pewter. Lina End Table |It’s been said before, but we love terrazzo. Ok, obsessed might be a better word. The Lina end table features Smooth, terrazzo-flecked concrete is elegantly cinched into a modern hourglass shape. It also comes in a dark grey. Douglas End Table | Precise curves with modern presence. Rounded base and tabletop of aged bronze-finished aluminum are connected via a shapely ring, for an open look and fun blend of scale and proportion. Safe for outdoor use, too! Cruz End Table | Unique in every way, this table makes for a playful pedestal and can be used indoors or outdoors. Cover this table during cases of inclement weather to protect its antique rust finish. When a coffee table is this striking, you can’t help but style it in the center of the room. Style these beauties with some fresh greenery or styling beads for some extra oomph. Keppler Square Coffee Table | Style, squared. A low, modern-minded coffee table of solid bluestone sits within a rustic black iron framing, for a light look with substantial feel, and a side of industrial edge. Mazie Woven Coffee Table | Stacked with style. Black hairpin legs support double shelving of natural rattan, for a textural, global-spun look inspired by the mid-century living space. For indoor use only. Bowman Outdoor Coffee Table | Grey concrete forms a faceted base for impact from every angle. A roomy, rounded top is ready to welcome guests indoors or out. Cover or store inside during inclement weather and when not in use. Pascal Bunching Table | Pandan rope, hand-woven in Indonesia, reveals its natural texture for a light, neutral look. Soft curves deliver a subtle modern spin to the traditional drum-inspired shape. Perfect in pairs. With countless new styles and updated upholstery options in some of our old favorites, we are so excited to reveal these fabulous accent, arm, and dining chairs. Diana Chair | Effortlessly cool. Available in butterscotch top-grain leather and ivory performance-grade fabric, angular track arms complement supple cushioning, with exposed parawood framing delivering the drama. Orion Chair | Mid-century modern styles pair perfectly with any space because they blend so seamlessly with traditional and modern. 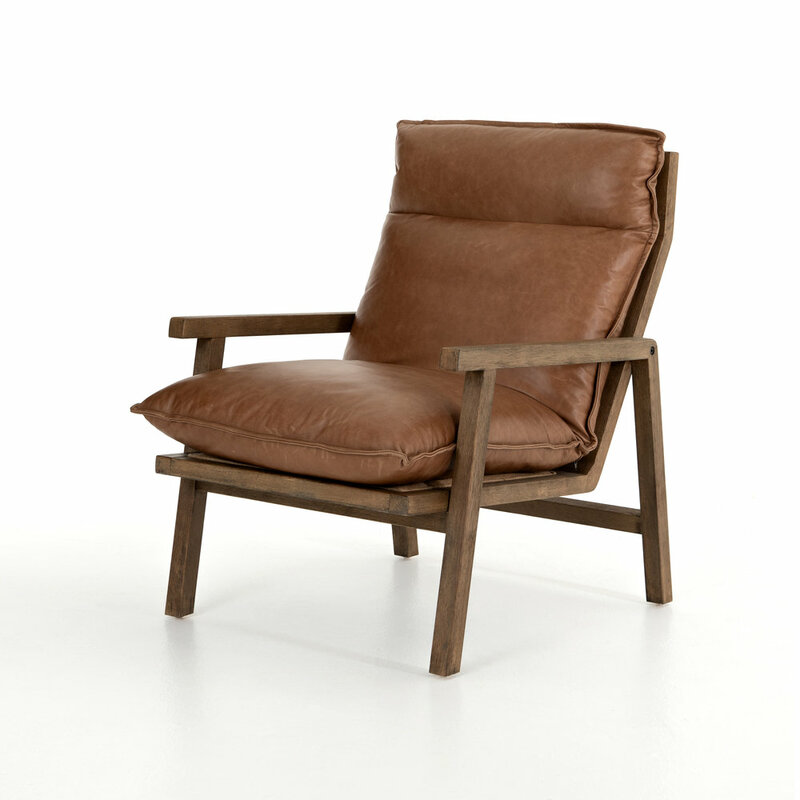 This chair features top-grain leather, a parawood frame, and ladder-back detailing. Mimi Dining Chair | Seductively simple. Framed by weathered oak, light tan top-grain leather features the glint of gold nail heads squaring out its back. Chance Recliner in Dakota Black | A dramatically shaped mid-century frame, modernized by channel tufting. Black top-grain leather contrasts with natural parawood, for a clean, cool look with vintage airs. Silas Chair | A striking silhouette with design-forward details any way you look at it. Top-grain, hand-finished leather sits in a whitewashed ash frame fastened by parachute strapping made of canvas, leather and metal buckles. 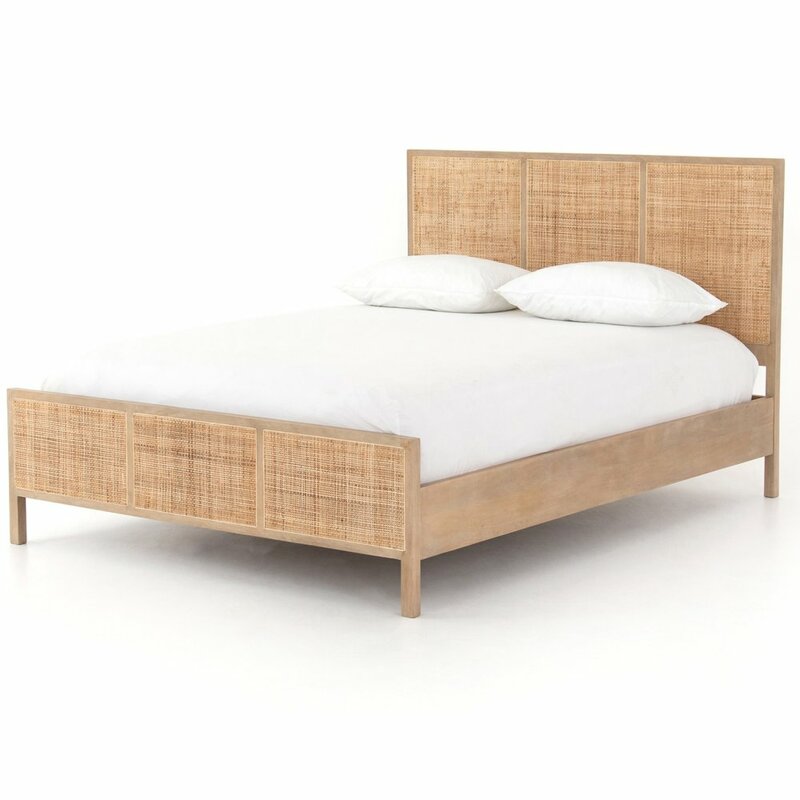 Sydney Bed | Natural mango frames woven cane, for a light, textural look with fresh organic allure. Three-panel head and foot boards add a detail-rich touch. Belmont Storage Nightstand | Sleek and industrial-inspired, black iron forms a tall, spacious dresser, with and brass knobs for cool contrast. Great solo or doubled up for stylish bedside storage. Mae Bed | A textured take on a clean silhouette, as a grey upholstered headboard adopts vertical channeling. Silver steel legs for a minimalist finishing touch. Waverly Iron Bed | Soft and feminine with a found feel. Hand-wrought iron is shaped by hand into an intriguing arc, with open railing for a light look.